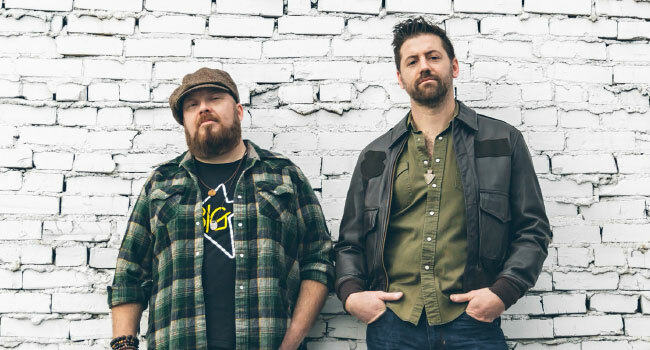 Country listeners’ tastes are changing and Jericho Woods, a duo from Breckinridge County, KY, are helping seal the fate of pop oriented bro country. The neo traditionalists are making a big impact with their new self-titled six song EP. Josh Mitcham (guitar/vocals) and Paul Priest (bass/vocals) are two dads who quit their day jobs to pursue music and that’s paying off. The pair mix elements of roots rock, southern rock, country and bluegrass for a refreshing throwback sound that was once popular among Millennials. The Kentucky natives have reached Top 25 on iTunes Country album chart, #8 on Billboard’s Heatseekers chart and have even been voted Best Kentucky Band of 2016 by Kentucky Living Magazine. This says a lot! The EP pushes country back to the good stuff before Luke Bryan and Jason Aldean ruled the charts. Jericho Woods reminds me of Van Zant (“Show Me“), Clint Black and John Mellencamp, although neither Van Zant nor Mellencamp were considered country in the Nineties. The EP is full of heart and soul with no overproduced tracks. You won’t find any horrendous drum loops here, either. It’s all organic and roots based which is a pleasant surprise since the modern sound we’re subjected to hearing these days highly concerns me. They each have unique voices that compliment each other. I get a Jeff Carson and Richie McDonald vibe from their voices. Smooth and pleasant to hear. The EP’s first single “Better Now” is an uptempo two stepper that is refreshing and exciting. The track is a great introduction to making Jericho Woods mainstream and needs to be played on the radio. I’m typically leary of giving new artists a chance given today’s overproduced, pop music climate. I mostly receive junk music to review and can’t get past a few seconds, typically. This was not the case to Jericho Woods. They are well versed in the vocal department and write their own songs, too. True country fans will give them a chance while many will snub their originality.